Plymouth Harbour is an important part of Britain’s maritime history and on any visit to Plymouth, one of the things to do is to go on a Plymouth cruise of this historical harbour. Once an old trading port, Plymouth Harbour is famous as the starting point of many pioneering voyages. When the Pilgrim Fathers made their epic voyage in the Mayflower in 1620 to discover their new world of America, it was from Plymouth that their ship set sail. On the Plymouth harbour cruise, we can get a sense of some of this history. There are different types of cruises offered by a number of cruising companies, including a longer cruise that goes up the River Tamar. From the Barbican Landing Stage, the Sound Cruising harbour cruise that we went on took us past RAF Mount Batten and along the famous Hoe to take in the views across Plymouth Sound, passing the Royal Citadel, Smeatons Tower, Drakes Island and the beautiful Mount Edgecombe Park. 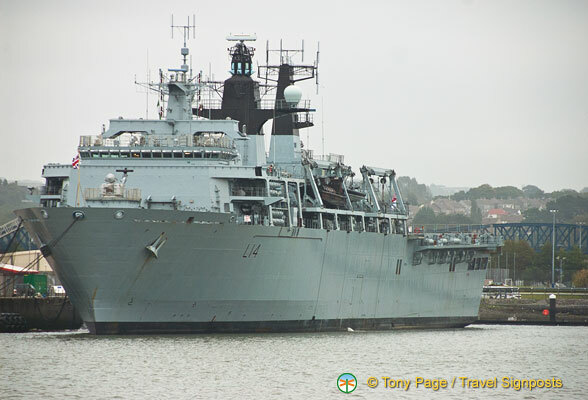 Our cruise also took us close to HMNB Devonport, the largest naval base in Western Europe, and an important part of Britain’s naval defence history. At the Devonport Dockyard there were many navy ships and a few submarines were docked. The cruise commentary was very good and the crew member imparted a lot of information about the ships and submarines. Just in case you think that they are giving out military secrets, this information is available online. We arrived in Plymouth on a rather grey day and it was a little chilly on the the top deck, but the cruise was nevertheless enjoyable. Sir Francis Drake, Sir John Hawkins, Sir Walter Raleigh, Captain Cook and Charles Darwin all sailed in Plymouth Harbour and although our Plymouth cruise boat was not as elegant as those sail ships, we can now say that we’ve cruised in Plymouth Harbour as well. See more Plymouth cruise photos at Travelsignposts Plymouth photo gallery HERE.